Jigsaw puzzle to be printed with your favorite pictures. There are pearlescent on the surface, it looks will be more top grade. It's one of the product that have price and quality advantage of our company. 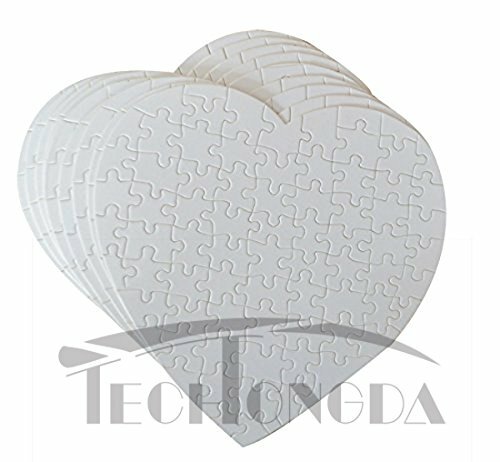 10pcs Heart Sublimation Jigsaw Puzzle The sublimation puzzles are coated with a special coating for heat transfer using a heat press. And they have glittering on the surface, the impression after heat transfer is colorful and reality. * We have heart and rectangle sublimation puzzles * Jigsaw puzzle to be printed with your favorite pictures. * There are pearlescent on the surface, it looks will be more top grade. It's one of the product that have price and quality advantage of our company. If you have any questions about this product by Sublimation Blanks, contact us by completing and submitting the form below. If you are looking for a specif part number, please include it with your message.